Many things have intrigued me about stone circles and ley lines. Ley lines can be both natural energy lines and created energy lines. Stone circles were created. So were the energy lines there before the stones? As dowsers we have always recorded and measured these energy flows – usually in cold, wet, windy places. We may have even tried creating these energy flows by making stone circles, albeit small ones. The next leap forward I see taking place, is in firstly correlating the energies of stone circles with different numbers of stones in them. What are the properties of even numbered stone circles as opposed to uneven ones? Are some better for healing? What are the benefits of those energies? Why is there a noticeable number of nine-stone circles? The other leap forward is to use the energies as opposed to just recording them and their fluctuations? Which events move and change theses energies. I believe SAM – Stone Age Man – was a lot more advanced than us in his use of energy. He not only built monuments to use the existing Earth energies, but modified them for his own use. We will consider three areas of use that he might have employed: Communication, Time and Travel. Many people are familiar with Zener Cards, which were used for telepathy experiments. These involved 5 different shapes, but using these gave a 1 in 5 chance of being right. I expanded and altered this idea to have 6 shapes and to use 6 colours, red, blue,green, yellow, brown and black. Each shape was available in the six colours. This gave odds of 6 x 6, or 1 in 36, which was a more acceptable for dowsing work, rather than guess work or luck. Then one person randomly shuffled the modified ‘Zener’ cards,and took out a card, which they then looked at for 5 minutes. ‘thinking’ the image of it along the ley line. The dowser went through their list of options to pick out the ‘correct’ symbol-and colour, When this experiment was first conducted all those years ago, the success rate, after the first few tries, grew to 90%. Another interesting part was that we could put a timed message into the lines, and retrieve it later. This was decades ago. Now we think nothing of putting out a message to a person which they pick when they are ready. We call it e-mail, and use wires instead of lines but that could all change with the new quantum communications. We really need a large data base of experiments, because ours were just a few. In a recent one,conducted by the DRG (Dowsing Research Group – Ed. 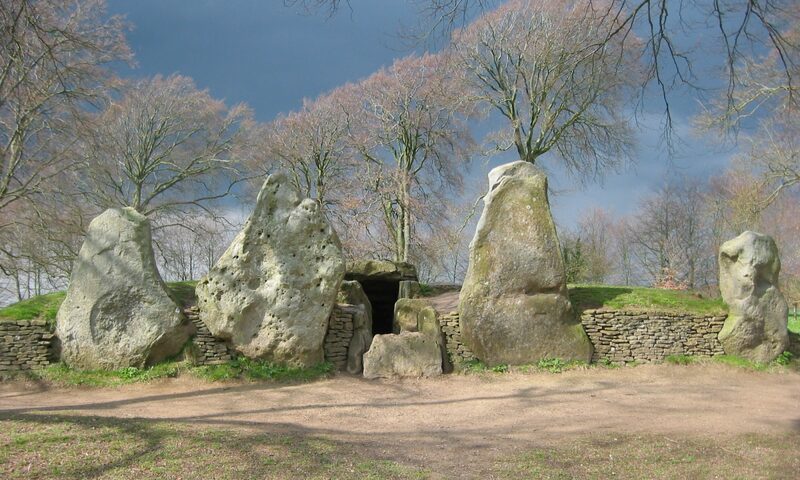 ), at Stanton Drew Stone Circle, (in appalling conditions), it was found by one pair of dowsers, that the colours received by each one were complementary to the other. So the questions are – can a message be left on a ley line, or can it be even be secure for one particular person? Did SAM have his own newspaper distribution system? Did he collect his own e-mails as he travelled from circle to circle? So not only may SAM have received his news which travelled faster than he could, but there are many stories of wizards and holy men etc., suddenly appearing where there was an important event. How did they get there so quickly? Could “Beam me up Scottie”, be a real possibility? Cup-and-ring markings have always intrigued me, and again., one day in my youth I came across a slab of rock in Western Scotland, with several such markings. I dowsed ley lines running from this point through the various gaps, over hills etc., in the landscape. These ley lines appeared to correspond to gaps in the cups and rings. I later followed this up with map dowsing, and found ‘significant’ places in those lines Were the number of rings, distances? Why then was my whole impression that, the slab of rock was a map? When I stood on the slab the next morning, I realised I needed something to locate which cup (and ring system), which I had now identified as my map system, that I wanted to use. I had with me a blackthorn walking staff, so I put it in the cup and held the top of it. I was concentrating on the stone circle further along the ley line in the direction I had chosen,when I was suddenly knocked off the slab. The people with me had panicked when they began to see the countryside THROUGH me. I had become transparent! Their only concern was that I had the car keys! Could I have been lost somewhere else in Scotland? Could it have been further than Scotland? Across the water? What about those stone circles which dowse to have connections with other constellations? Could we communicate with them? Could our own version of the ‘Star Trek’ transporter, beam us that far? However, and importantly – would we arrive intact and alive, or scrambled and not? Perhaps this experiment should be approached with caution ….. I have spent many years learning and discovering how to control these energies. One discovery was that a wooded staff was needed. But which wood? The Celts had a sacred tree, for each of the lunar months. Would one wood be suitable for all months, did it depend on the energy flows or job in hand,or even the person? I found that yew wood, especially English yew covers most of these eventualities. It would have to be both sapwood and hardwood, and be of about my height. The quest to find the perfect staff itself took some years. I found it in a Saxon village re-enactment group at a craft fair. The discovery itself seemed to be wrapped in some kind of time warp, as I didn’t notice the knight’s tent until the afternoon of the second day of trading. So I strolled across, to find a Bowyer there On asking why a medieval bow maker was in a Saxon village, he told me that one of the other Saxon villagers was his friend, and that as he was bored for the weekend, he had brought along his stand. Even more amazing, was that the Bowyer lived in France, and that this weekend fell between two medieval shows for which he had come over. He told me that most long bows were now made from Spanish yew as seasoned English yew was rare, but better. But it just happened that he had two 8 inch square blocks which had just come his way. The larger one was dowsed and found to be perfect for my needs. A couple of weeks later a six foot parcel arrived. My synchronistic staff had a bi-directional energy field. This has been found consistently to alter the energy fields of standing stones, and to change the flow within stone circles. In one experiment, I went to Mitchell’s Fold Stone Circle in Shropshire, which is about a mile away from another, much smaller stone circle. There was an observer a hundred yards away, who this time held the car keys. With one of my border collies I went into the circle. I dowsed the key stone and a place to stand. I then put the staff on to the energy point and began to concentrate on the other stone circle. As my concentration increased, the circle felt as though it was spinning and I began to feel that I was being pulled both thin and outwards. I could hazily see the view from the other stone circle. Suddenly the vehicle horn blasted. My observer had decided to act when a swirling fog had appeared only inside the circle, quickly building up until the dog and the lower part of myself were lost from sight. The horn was sounded as the fog was covering all of me. It has often been said of me that I exist in a different time flow, which occasionally coincides with that of the rest of the world. I can be observed to be constantly working yet an extra hour or so goes by compared to everyone else! Does time travel at a linear rate,a straight line? Is it a steady flow? I have always thought it travelled like a sound wave. This means that some parts of the wave can get compressed, thus travelling faster in the shorter distance; while other parts can become stretched – rarefied – thereby travelling slower over the longer distance. I believe that it is more of a spiral path as this would allow us to ‘step across’ into another time flow. Where,or rather, when we emerge compared to our present flow is debatable. Does the outline of this theory dowse as correct? To return to the Cup & Rings. Can we control not only the place we can travel to, but also the when? If we are trying this to travel we must remember to keep our mind fixed firmly on the present! There are now serious scientific theories being postulated on the nature of time. However, as Dowsers, we have already been experimenting through time; we dowse for where ‘things’ were in the past, and track people and objects. We are working through time! I instigated an experiment with the Dowsing Research Group, in which we constructed two small stone circles in our meeting room, placing a clock in each, with one also outside the circle. We then used our pendulums to wind the energy of time, for one circle faster, the other slower. We found, after about two hours, a two minute difference. We were not being strictly scientifically accurate. Unfortunately, we were frequently stepping over one of the circles. Were the batteries being affected, were the circles too close together, but were we causing something to happen? Myths and legends suggest that we can travel through time.’Wizards’ arrive at the time when they are needed. There are places on Dartmoor and near Wells, to name but two, where you can step into a different time dimension and be lost to this world for years. Dowse these portals yourself, but don’t get lost! We, as Earth Energy Group members, have dowsed these energy streams, we know they exist, but what are they for, what do they doand how?